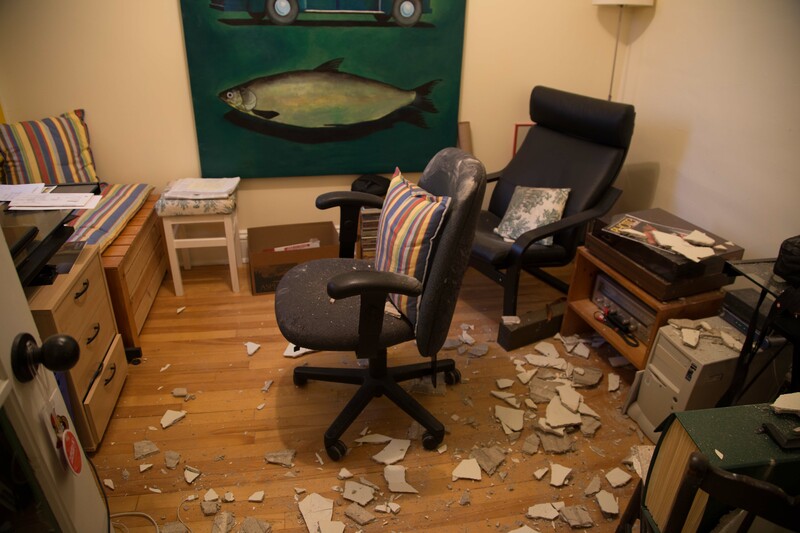 I came home from work today to find that the ceiling in one of the upstairs rooms had fallen in. Fortunately nobody was in the room when it happened and the cat was quick enough to be long gone before anything could hit her. The vibrations have obviously exceeded whatever limit might have been set for a house built in 1910 to withstand. It would be interesting to know if the bylaw stipulates a different level of vibration for different types of home construction. So they are digging right next door to us. And it feels like a massive shovel smacking the side of our wall. Really unnerving. We had a building inspector from the City of Ottawa yesterday. Since they have started the drilling underneath our homes we have been noticing a lot of cracks everywhere. We are concerned. So we called the city up and the news isn’t good. He noticed that our floors are also tilting in certain areas. WHAT!? The house is moving? He said we were safe but to call if there was any sudden movement. We will get the developer in to check it out as well. Thank God this is over! Will never be the same after having lived through this sheet piling saga. What else are they going to throw at us?